According to the CDC, more than a half million babies in the United States—that’s 1 in every 8—are born premature each year. Some babies are so small they could fit in the palm of your hand. A baby that is born at least 3 weeks before the due date is considered preterm. Most infants that die were premature. But those that do live spend a long time in the neonatal intensive care unit and may have lifelong problems in the future. 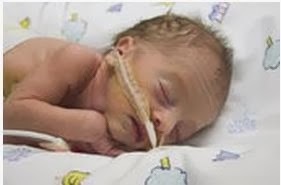 A lot of premature babies are born because the mother experiences preterm labor. Don’t lose hope yet. Doctors have come a long way in preventing preterm labor. If you believe that you are at risk of having a premature baby there are several different ways that you can prevent preterm labor from starting. Your doctor may order a test to be done to determine if you are at risk for experiencing preterm labor. SalEst test measures the levels of the hormone estriol in a pregnant woman’s saliva. It has been proven that there is often a surge in this chemical several weeks before early labor. After week 22 your doctor can also conduct what is called fetal fibronectin test. Fetal fibronectin is a protein found in the amniotic sac and fetal membranes. This protein isn’t usually present until around week 38. Your doctor can test the level of fibronectin by doing a simple vaginal swab. Test results are usually available within 24 hours. If either one of these tests conclude that you may experience preterm labor your doctor could advise you to drink plenty of fluids and put you on bed rest. Laying on your side can help stop the contractions that lead to preterm labor. If bed rest isn’t successful your doctor may also prescribe medications to stop the contractions. Muscle relaxants such as ritodrine is used in the treatment of preterm labor. It can be given in three different forms; intravenously, as an injection or in pill form. In most cases ritodrine is first given intravenously and requires a hospital stay. Side effects may include a rapid heartbeat, hypo tension, the feeling of apprehension or fear, chest tightness or chest pain, changes in the heart’s electrical activity, fluid in the lungs, increased blood sugar, low blood potassium and even a diabetic reaction. Terbutaline is also a commonly prescribed medication to treat preterm labor. The side effects of this medication are similar to those of ritodrine. If your contractions get harder to control your doctor may put you on both medications and have you alternate between the two every few hours. After week 36 it is safe to go off of all medications and bed rest. Talk to your doctor right away if you believe you are at risk of experiencing preterm labor.